Homes for sale near Lake Limerick are single family residences on quiet properties north of the lake or south in the Lake Limerick Golf Course community; they often include rambler, traditional two-story, and custom built homes. Lake Limerick is about 7 miles north of Shelton and 15 miles south of Skokomish and Hood Canal. 2 Beds | 1.75 Baths | 1040 sq. Ft.
3 Beds | 2 Baths | 2254 sq. Ft.
2 Beds | 2.25 Baths | 1364 sq. Ft.
1 Beds | 1.75 Baths | 1793 sq. Ft.
Creekfront lot located with the Lake Limerick development. 2 Beds | 1.75 Baths | 2644 sq. Ft.
Blue Summit Realty has the most accurate and up to date Lake Limerick real estate listings on the web. Currently there are 5 homes for sale, and 12 vacant land properties in Lake Limerick. Of the 17 total Lake Limerick residential listings for sale 0 are bank owned, 0 are short sales, 0 are new construction, and 0 are townhomes. The price ranges from $209,900 to $0 with a median list price of $287,350 and median sold price of $212,400. Make sure to refine your Lake Limerick real estate search by property type, price, square footage, bedrooms, bathrooms and more with the search tool above or view the Lake Limerick listings on our interactive map. 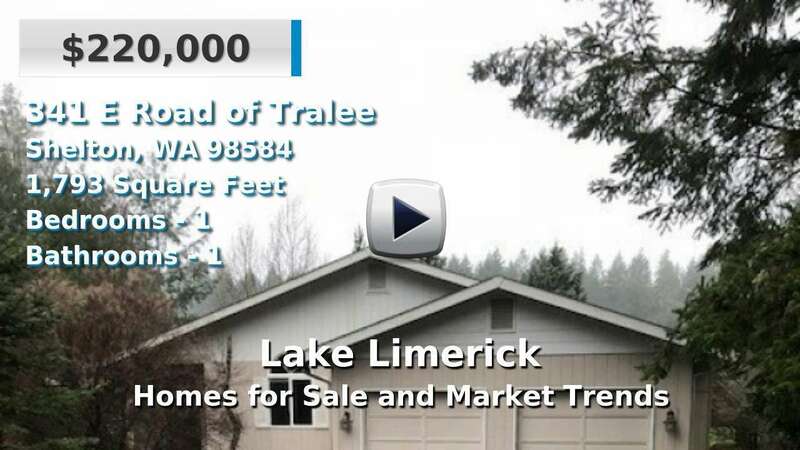 Our Lake Limerick real estate listings were updated 7 minutes ago.